Photo courtesy of Creations by Chelsy Photography. All rights reserved. The call came while Bree Hanson was in study hall, just days after she'd found the perfect prom dress. A junior at Tioga High School in Tioga, N.D., Hanson has a congenital heart defect called double outlet right ventricle, in which both major arteries are connected to her heart's right ventricle. She knew that one day, she'd need a heart transplant. And after a year of waiting on the transplant list, she finally got the call. She had the transplant Feb. 25 at Mayo Clinic in Rochester, and everything went swimmingly. But the three-month recovery period would cause her to miss her high school prom. Or would it? Thanks to her classmates and her care team, Hanson was able to attend her school's prom this past Saturday through the magic of technology. 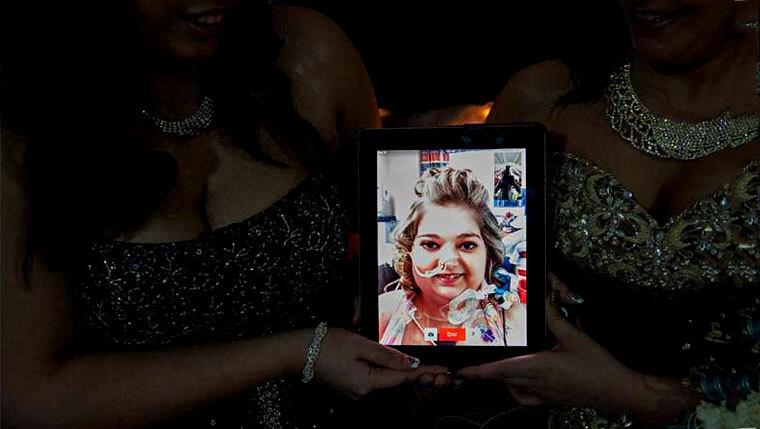 One of her friends "walked" her through the prom's Grand March using FaceTime on an iPad so she could experience prom as if she were there in person. To get Hanson ready for the big day, Alexandra Hansen, a Mayo patient care assistant who has a background in cosmetology, did her hair and makeup. "It was absolutely amazing," Bree Hanson tells Twin Cities TV station KARE 11. At the start of the evening, Hanson's classmates held up signs of support with messages like "Get Well Soon, Bree" and "We Miss You." A photographer was there to capture it all and turn it into a nifty video, which you can see here. It was a moment that Hanson didn't think she'd live to see. "They didn't expect me to live as long as I did, but I followed everything, listened to the doctors. I made it, so it's pretty exciting," she tells KARE 11. Hanson experienced another "pretty exciting" milestone in the hospital in Rochester when she turned 18 on Tuesday, April 1. Her family and care team helped her celebrate with "pink decorations and a pink camouflage birthday cake." It was just one more of life's moments that Hanson tells KARE 11 has helped her to better understand and appreciate the greatest birthday gift she'll ever receive. "I hope to live my life to the fullest and be happy, because I have a second chance in life now," she says. Hanson's story is made possible, of course, through organ donation, and her mom, Terry West, says she hopes they will get to meet the donor family one day. Since April is national Donate Life Month, we'd be remiss if we didn't remind you that you can help others like Hanson by registering online to become a donor. Or, the next time you renew your driver's license you can check the box that asks if you want to become a donor. Watch the video from the Grand March below, see the KARE 11 story here, and then give us a sign of support by sharing your comments.